Through the years The Persuasions were mistakenly categorized as a Doo Wop group. In fact, Doo Wop was long considered “oldies” when The Persuasions’ first recording was released in 1969. Lead singer/arranger/co-producer Jerry Lawson created a new genre of music, today known as Contemporary A Cappella. That is, the Persuasions were the first A Cappella group to create secular, street singing arrangements of an eclectic array of the most popular music of the day, over a four-decade career. Jerry was forever trying to correct the mis-labeling of The Persuasions, to journalist after journalist. The Persuasions were never a Doo Wop group, but when they started out, A Cappella was not a familiar word even to most well-seasoned journalists. Reviewers figured five African-Americans from Brooklyn’s Bedford-Stuyvesant who sang on street corners must be Doo Wop. The label stuck and was perpetuated through 40 years. If you listen to the massive body of The Persuasions’ recorded work, you will hear not only a myriad of song styles, but singing styles. Jerry is sometimes a crooner, sometimes an R&B/soul singer, sometimes a gospel artist, sometimes a rock ‘n’ roller. He didn’t intend to create Contemporary A Cappella — he and The Persuasions simply loved and excelled at many different genres of popular music. 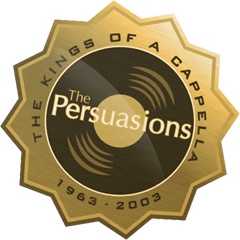 As he used to say, “We can Persuasion-ize almost anything.” Ironically, in the ‘80’s and beyond, many other wonderful groups—from The Bobs to Sweet Honey In The Rock and Rockappella were hailed for founding Contemporary A Cappella — when The Persuasions had been doing it since the ‘60’s. To drive the point home, Jerry was emphatic with booking agents that they turn down all offers to perform or participate in any Doo Wop shows. He felt that would be the death of The Persuasions if they were to get boxed in like that and forever be known as an “Oldies” group. Yes, The Persuasions always, from the get-go, included a few Doo Wop songs in their act—out of love of the genre—but this was a tiny portion of their repertory, and they never dreamed they would be typecast as Doo Wop or “oldies.” As Jerry is fond of saying, “Ya can’t Doo Wop ‘The Lord’s Prayer!’” His own musical background was eclectic—before the term became popular—and he and The Persuasions covered legends including Brook Benton, Roy Hamilton, Sam Cooke, Jerry Butler, James Taylor, The Oakridge Boys, The Partridge Family, Frank Zappa, Elvis Presley, Kurt Weill, The Grateful Dead and on and on. The other Persuasions brought their influences to the mix, as well. Joe Russell came from a heavy gospel background, and loved soul music. Jayotis Washington brought touches of jazz to his occasional lead vocals on novelty songs. Toubo Rhoad loved Ray Charles. Bass-singer Jimmy Hayes, the group’s rhythm section, fit his miraculous voice to any style.